This workshop is perfect for you if: you have trouble writing about your work or a certain project, you don’t have the time or motivation to prepare written work to apply for opportunities, or even if you love writing about your work but aren’t sure if it’s working to enlighten your audience in the right way. We will be writing during the workshop, and worksheets will be provided. Feel free to bring your current/past artist statement, but it is not necessary. You will also want to have access to images of your work (can be digital, on your website, etc.) You are welcome to bring a laptop, if you prefer to write that way. CLICK HERE TO REGISTER. When people ask, “What do you do?” do you have trouble answering, or tend to ramble on? Talking and writing about your work in an exciting and confident way is the best way to open doors. During this workshop we will cover: your elevator pitch and why it’s important, how to network and create different opportunities to talk about your work, and tips to overcome stage fright. You will leave with: a new confidence in talking about your work, a checklist of what next steps to take on your public speaking skills no matter what stage you are at, a list of helpful tricks, tools and resources, and a plan to assure that your pitch will be audience ready! To register, click here. This workshop is perfect for you if: you have trouble writing about your work or a certain project, you don’t have the time or motivation to prepare written work to apply for opportunities, or even if you love writing about your work but aren’t sure if it’s working to enlighten your audience in the right way. To register, click here. Back by popular demand! Hannah will be back in town to give her super-informative tax workshop. Come learn! What can I deduct? Do I bring receipts to my accountant? Is my art a business or a hobby? What is a Schedule C? How do I deduct my home studio? Hannah Cole is a tax expert who specializes in working with creative businesses and artists. A long-time working artist, the financial challenges of freelancers and small creative businesses are both relevant and personal to Hannah. She will discuss the basic tax equation, self employment tax and the estimated quarterly tax system, audit concerns for the working artist, and other tax issues specifically relevant to artists, followed by a question and answer period. Hannah Cole is the founder of Sunlight Tax, which specializes in friendly, informative tax preparation for artists, and engaging, art-world savvy tax education workshops for artist groups. To register, click here. What can I deduct? Do I bring receipts to my accountant? Is my art a business or a hobby? What is a Schedule C? How do I deduct my home studio? Hannah Cole is a tax expert who specializes in working with creative businesses and artists. A long-time working artist, the financial challenges of freelancers and small creative businesses are both relevant and personal to Hannah. She will discuss the basic tax equation, self employment tax and the estimated quarterly tax system, audit concerns for the working artist, and other tax issues specifically relevant to artists, followed by a question and answer period. 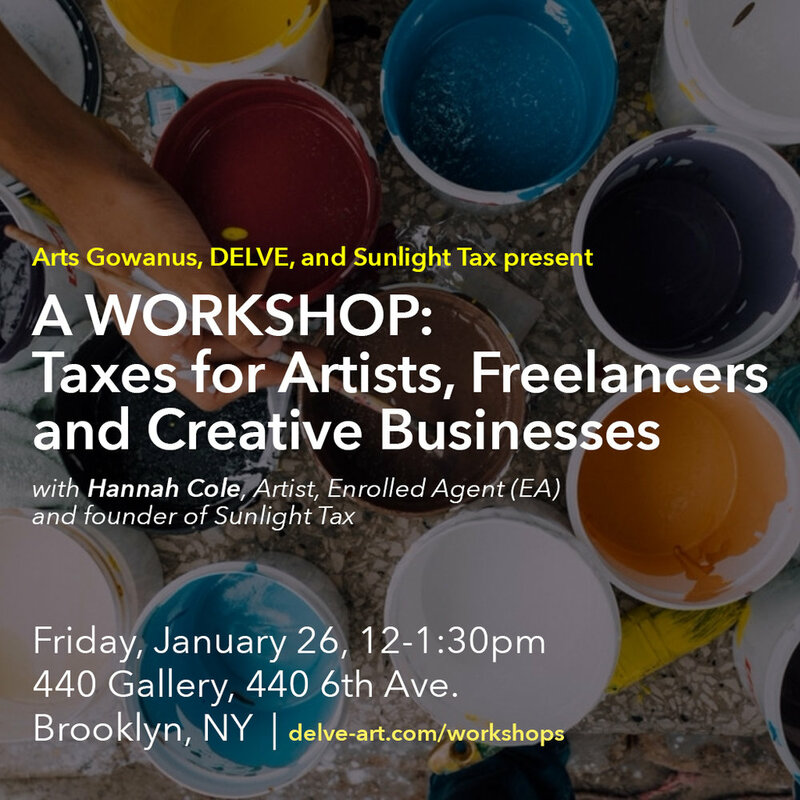 Hannah Cole is the founder of Sunlight Tax, which specializes in friendly, informative tax preparation for artists, and engaging, art-world savvy tax education workshops for artist groups. To register, click here. We are happy to be bringing our elevator pitch workshop to Buffalo on November 9, 2016! The artisan community of Shopcraft will get together and practice how to confidently, clearly and genuinely talk about their work. We are excited to bring our Artist Statement workshop to the students of American University on October 12th. Sara will be speaking to the Professional Practices class. Your Complete Visual Story: A Marketing Calendar for GOS 2016 was a workshop held in July 2016 for artists preparing for Open Studios. Marketing your work and having a successful GOS 2016 all starts with a solid foundation: knowing your unique story as an artist, and having the written content and visuals to support it. This is the first step to executing a confident and flawless marketing campaign and making sure the visual presentation of your work is amazing. We are excited to be presenting the DELVE Workshop: Crafting an Elevator Pitch and Developing the Confidence to Use It on Friday, February 26th, 2016 in Boston, MA. Get tickets to this very amazing conference here. On March 15th we had the pleasure of traveling up to the small town of Wassaic, New York to conduct Studio Visits with the Arists in Residence there. HOW TO WRITE A KILLER ARTIST STATEMENT, AND MORE. This workshop is perfect for you if: you have trouble writing about your work or a certain project, you don’t have the time or motivation to prepare written work to apply for opportunities, or even if you love writing about your work but aren’t sure if it’s working to enlighten your audience in the right way. Read more here. We are happy to be have been included on the lunchtime panel for Art Business Institute's Workshop, Art + Business NYC on September 28th. 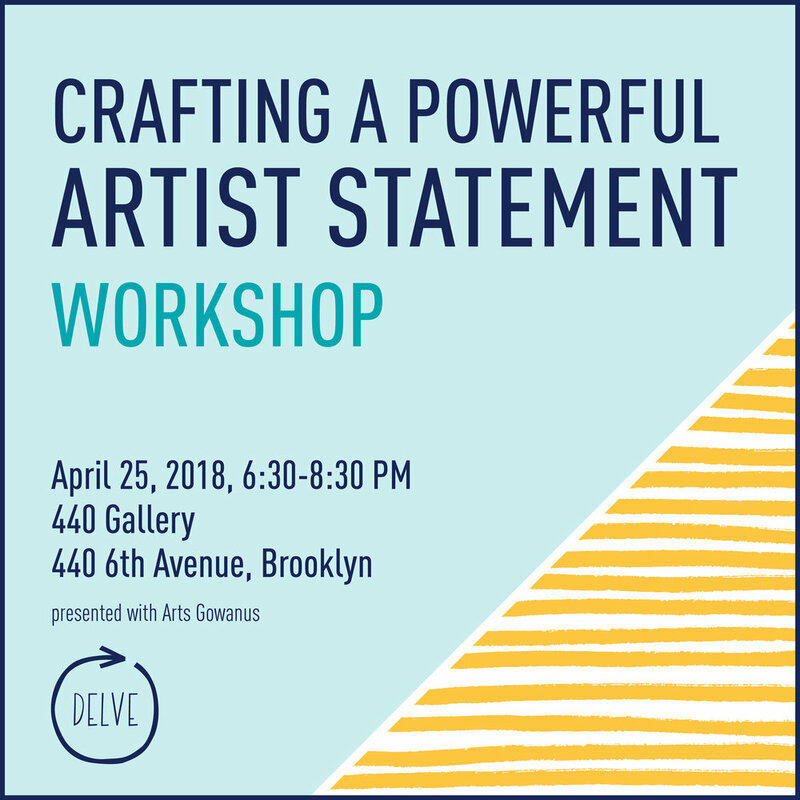 The whole workshop looks amazing, especially for those who want to learn more about the business of your art practice, selling wholesale and more. Check it out here. As an artist, it’s important to remember all of your past accomplishments and unique story as an individual in order to a) focus on your well-deserved accolades b) highlight how you stand out from the crowd and c) think about your path so far, and where you want to go professionally. On October 15th, 2014, Sara Jones had the pleasure of working with BFA students at Marymount Manhattan College. "Power Shift: Becoming an Artist Entrepreneur"
Thursday, October 23, 2014 at 7 p.m. The second in a series of talks and professional development activities for artists and designers looking to brand, build, and grow their creative enterprises. Today’s workshop features Sara Jones and Andrea Wenglowskyj of DELVE/Kind Aesthetic. Tickets are $15, or $30 for the entire three-part series. On October 29th, 2014, we had the pleasure of leading a workshop at SVA's Interior Design Department. Fact: you are the only person in the world who does exactly what you do in your unique way. Defining your professional story is an essential component of sharing your future brand and business with the world in a successful, meaningful fashion. During the lecture, we’ll cover the crucial steps to telling the story that you and your future clients want to hear, see and be part of. We’ll begin by sharing examples and the building blocks of building a brand, and follow it up with a productive workshop session to set you on the right path to building your unique story. Wednesday, October 29th at 7p.m. Queens Council on the Arts, 37-11 35th Ave, Entrance on 37th St, Astoria, N.Y.
As the saying goes, time is money, and as working artists living in one of New York City’s five boroughs, getting a handle on either can be a challenge. In this workshop, we’d like to take a hard look at your time, schedule, and practice in order to see how we can help you achieve more balance and inertia to reach your goals. Through some simple, straight forward, fun, and effective talking and exercises, we’ll work together as a group to reimagine your schedules in order to better fit business strategy and organization into your practice. An important component of this workshop series is exploring your goals and the unknown. Without focusing on what you want to accomplish professionally, how will you know who to seek out, which opportunities to apply for and where to focus your efforts? In the last workshop, you clarified your unique story and current exciting projects, and you are ready to talk and write about them in a clear, confident way. Now, what are the big dreams and how do you get there? You never know whom you will meet or what kind of opportunities you will come across to apply for, so you’d better be ready. Monday, November 24th: An informal speaker series highlighting the importance of Brooklyn art initiatives and how they positively impact our community. Monthly, we invite three speakers, each allotted 15 minutes, to talk about their history, mission and creative public programming. Learn, network and share ideas for a better Brooklyn. Andrea from Kind Aesthetic joined Isissa Komada-John from MoCADA and Daonne Huff from Groundswell. On October 27th and December 8th, we had the pleasure of meeting artists at NYFA: Have a new body of work no one has seen? Have a new website? Ready for some feedback? Come to NYFA’s Doctor’s Hours for individual, 20-minute one-on-one consultations with curators, critics and gallerists. Get practical and professional advice in person from one or more arts professionals. On October 2, 2013 we presented a workshop to visual artists about creative marketing, with follow up individual consultations on October 5th. This workshop is for artists who are looking to open and expand their market to sell their work in creative ways. By using The Marshall Strawberry Project as a case study, we will examine unique and powerful ways that an artist can harness to sell work outside of the traditional gallery model. This workshop is intended for participants to be inspired to think of new ways to market their work, and to analyze their art practice to potentially fit new modes of production into their studio time. On October 10th, 2013 we had the pleasure of talking and working with BFA students at Montserrat College of art, focusing on professional practices. Communicating your art practice verbally and visually is a vital component to life in school and beyond. We’ll cover the best ways to answer the questions “what do you do?” and “what kind of work do you make?” with confidence and clarity. In addition, you’ll learn how to best present your work to the public, both digitally and in-person at an exhibition. Since an artist’s work is always evolving, we believe that it’s necessary to make time for the organizational office work in tandem with the creative process, since this will lead to more opportunities, flexibility and more productive studio time. On December 4th, 2013, we presented about the path of Kind Aesthetic and our artistic careers at the gallery, Soho 20, for the Feminist Art Project. On December 4th, 2013 we had the pleasure of talking and working with BFA students at Hunter College along with Ryan Keberle, Jennifer Degregorio, Kelly Anderson, and Suzanne Lunden.